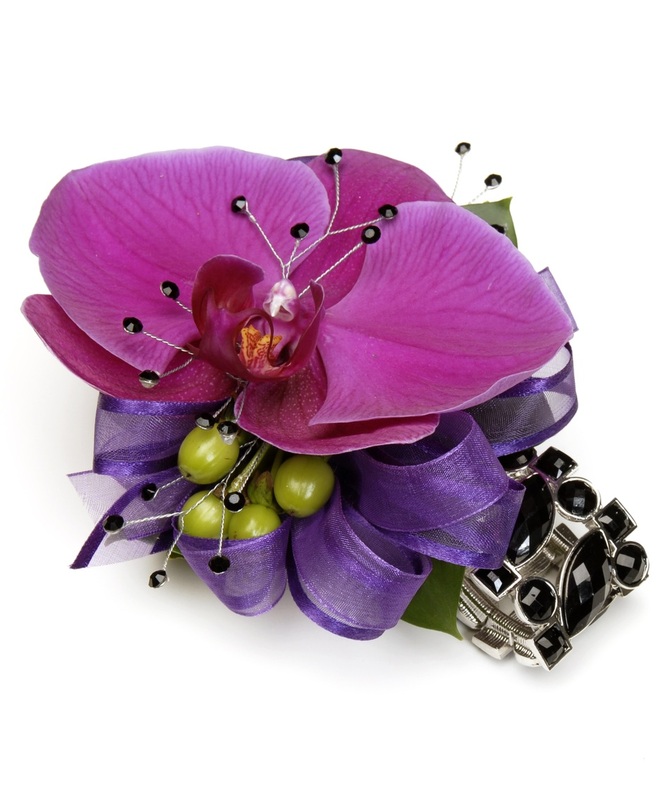 Coming up is prom season so this is the time to start planning for prom flowers, prom boutonnieres, and prom corsages. 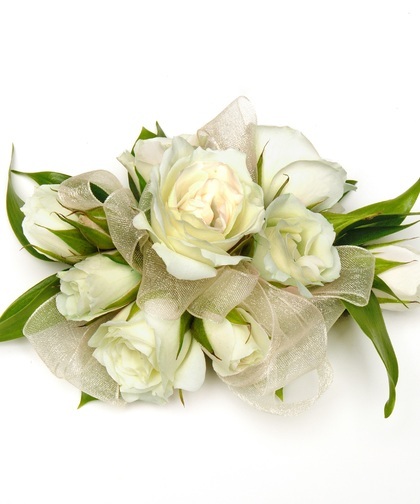 We have a wide selection of prom flowers to choose from, or you can create you own custom prom corsage and matching custom prom boutonniere. What color is your dress? You don’t want to pick the same color for your flowers because no one will be able to see it, especially if it’s pinned to your prom gown. Instead, go with a complementary color that adds to your look. What is your budget? There are a lot of costs with attending the prom, so make sure you set a reasonable budget for everything, including your flowers. What do you like? Don’t just go with what is trendy. Pick your favorite flower and make sure the style represents what you like, not what your friends like. This is a special moment in your life so make it about you. 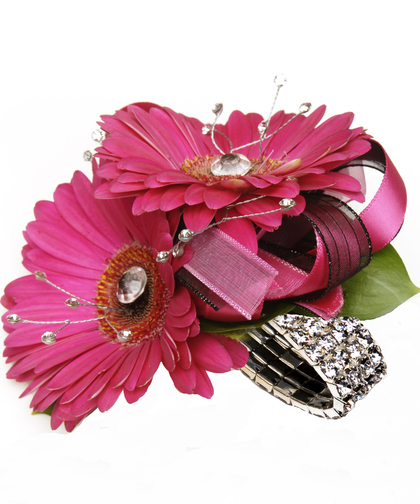 The Fashion Pink Gerbera Daisy Corsage features hot pink gerbera daisies, faux diamond studs, ribbon and a keepsake jeweled wristlet. The Dendrobium Orchid and Roses with Rhinestones has purple dendrobium orchids and roses along with rhinestones placed on a faux diamond “rock candy” wristlet. The White Sweetheart Rose Corsage is also a wristlet design with white sweetheart roses, sheer ribbon, and floral greenery. Each of these prom corsages has a matching prom boutonniere. 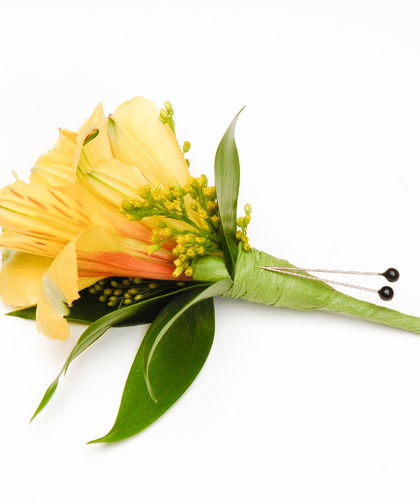 The Spring Yellow Alstromeria Lily Boutonniere offers a bright display for prom. 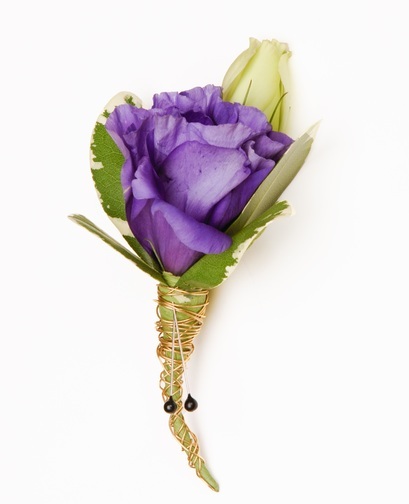 The Lavender Lisianthis Boutonniere is a unique floral display with a gold wire stem wrap. 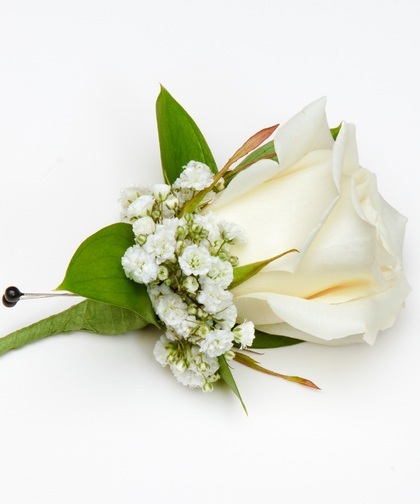 The Classic White Rose Boutonniere offers a traditional look for prom. We recommend ordering early for the best selection! You can also schedule an appointment to create your custom prom flowers. We deliver or you can pick up your prom flower order. It’s that time of year again for prom, which means picking out the best attire, getting a limo, and, of course, picking prom flowers, including a corsage and boutonniere. Atlanta high schools, including Blessed Trinity, Greater Atlanta Christian, Lovett, Marist, Mount Pigsah, Pace Academy, Walker, Westminster, Whitefield, and Woodward Academy as well as Alpharetta High School, Lassiter High School, Marietta High School. Milton High School, Pope High School, Roswell High School, Walton High School, and Wheeler High School are all getting ready for prom. 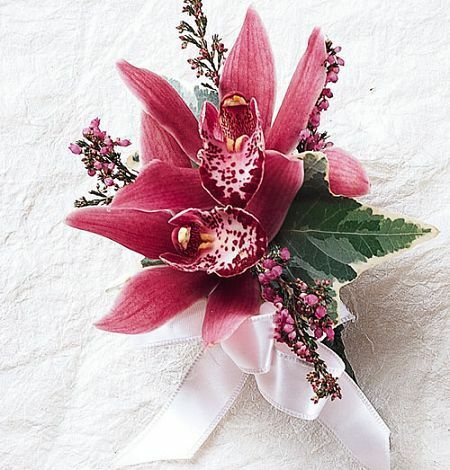 To help you get the perfect prom flowers to match your style and budget, we have a wide array of corsages and boutonnieres to choose from. Every year, the big dilemma is should the corsage match the dress? The answer is not necessarily because it should really serve as an accent or complimentary color to the dress color. 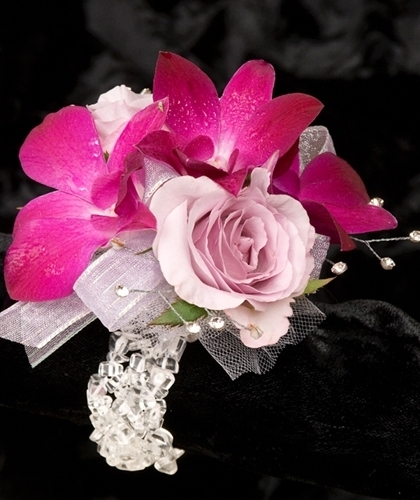 Since more corsages tend to be worn on the wrist than pinned on anymore, this helps create a nice contrast. You may also wonder what trends are prominent this year for prom flowers. The big trend continues to be ‘bling’ corsages that have rhinestones, pearls, and jewels as wristlet straps for the corsage. This can be kept as a keepsake long after the prom is over. Then, the big question is who orders the corsage? While the man always did that in the past, now girls, boys, and mostly moms are involved in the ordering process so that they are ordered together for greater convenience and value. To learn more, be sure to watch our prom video at https://www.youtube.com/watch?v=AuHhVGdQfXE. Besides our wide array of corsage and boutonniere choices, including favorites like roses, orchids, gerbera daisies, carnations, and more, you can also come into any of our Atlanta flower shops and work with our floral design team on a custom corsage that matches your style and color preference as well as your budget. We realize that prom day is a busy day, picking up a last-minute dress that has been altered and the tux as well as getting to the salon for hair, nails, and makeup. 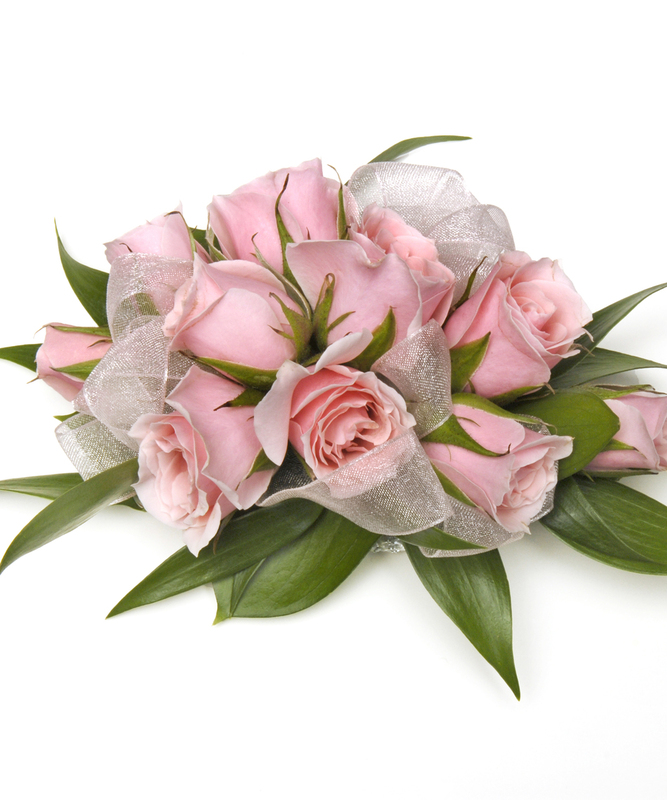 To help you make one less stop that day, we offer corsage delivery throughout the Atlanta area. 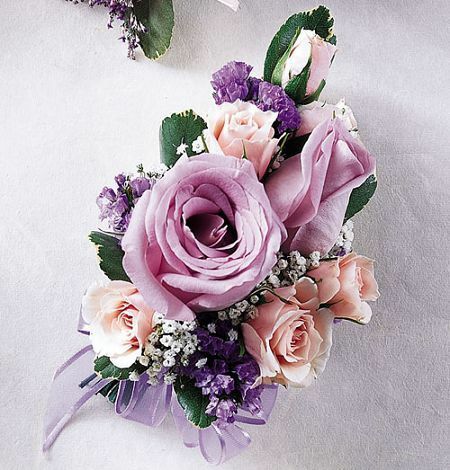 For $5.00, you can receive our “no worry” corsage delivery that is guaranteed to be at your door by 4pm.